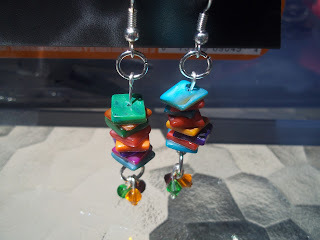 I'll get down to business, the winner of the earrings pictured below, is Susie of the blog, Vintage Susie & Wings. Send me an email with your address and I'll get these out to you post haste. As for the sale of my pieces, I'm trying to decide how best to offer my jewelry for sale. I'm not happy with Etsy or Ebay, and Wepay is just too finicky for my purposes. Anybody reading this have an idea for me? There must be a way to sell directly from the blog at the click of a mouse, no? I will gift anybody who can help me set this up with a $100 gift certificate towards my pieces (and free shipping) for their time and expertise. Thanks, loyal readers and fans!